The Gift: A Christmas, New Year, and Birthday Present. Carey and Hart, Philadelphia, 1845. The unnamed narrator is discussing with the famous Parisian amateur detective C. Auguste Dupin some of his most celebrated cases when they are joined by the Prefect of the Police, a man known as G—. The Prefect has a case he would like to discuss with Dupin. A letter has been stolen from the boudoir of an unnamed woman by the unscrupulous Minister D—. It is said to contain compromising information. D— was in the room, saw the letter, and switched it for a letter of no importance. He has been blackmailing his victim. The contents of the letter have not been revealed, as this would have led to certain circumstances that have not arisen. Therefore, Minister D— still has the letter in his possession. The ability to produce the letter at a moment's notice is almost as important as actual possession of the letter. Therefore, he must have the letter close at hand. The Prefect says that he and his police detectives have searched the Ministerial hotel where D— stays and have found nothing. They checked behind the wallpaper and under the carpets. His men have examined the tables and chairs with magnifying glasses and then probed the cushions with needles but have found no sign of interference; the letter is not hidden in these places. Dupin asks the Prefect if he knows what he is seeking and the Prefect reads off a minute description of the letter, which Dupin memorizes. The Prefect then bids them good day. A month later, the Prefect returns, still bewildered in his search for the missing letter. He is motivated to continue his fruitless search by the promise of a large reward, recently doubled, upon the letter's safe return, and he will pay 50,000 francs to anyone who can help him. Dupin asks him to write that check now and he will give him the letter. The Prefect is astonished, but knows that Dupin is not joking. He writes the check and Dupin produces the letter. The Prefect determines that it is genuine and races off to deliver it to the victim. 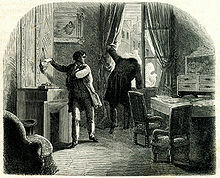 Alone together, the narrator asks Dupin how he found the letter. Dupin explains the Paris police are competent within their limitations, but have underestimated with whom they are dealing. The Prefect mistakes the Minister D— for a fool, because he is a poet. For example, Dupin explains how an eight-year-old boy made a small fortune from his friends at a game called "Odds and Evens". The boy was able to determine the intelligence of his opponents and play upon that to interpret their next move. He explains that D— knew the police detectives would have assumed that the blackmailer would have concealed the letter in an elaborate hiding place, and thus hid it in plain sight. Dupin says he had visited the minister at his hotel. Complaining of weak eyes he wore a pair of green spectacles, the true purpose of which was to disguise his eyes as he searched for the letter. In a cheap card rack hanging from a dirty ribbon, he saw a half-torn letter and recognized it as the letter of the story's title. Striking up a conversation with D— about a subject in which the minister is interested, Dupin examined the letter more closely. It did not resemble the letter the Prefect described so minutely; the writing was different and it was sealed not with the "ducal arms" of the S— family, but with D—'s monogram. Dupin noticed that the paper was chafed as if the stiff paper was first rolled one way and then another. Dupin concluded that D— wrote a new address on the reverse of the stolen one, re-folded it the opposite way and sealed it with his own seal. Dupin left a snuff box behind as an excuse to return the next day. Striking up the same conversation they had begun the previous day, D— was startled by a gunshot in the street. While he went to investigate, Dupin switched D—'s letter for a duplicate. Dupin explains that the gunshot distraction was arranged by him and that he left a duplicate letter to ensure his ability to leave the hotel without D— suspecting his actions. If he had tried to seize it openly, Dupin surmises D— might have had him killed. As both a political supporter of the Queen and old enemy of the Minister [who had done an evil deed to Dupin in Vienna years before], Dupin also hopes that D— will try to use the power he no longer has, to his political downfall, and at the end be presented with an insulting note that implies Dupin was the thief: Un dessein si funeste, S'il n'est digne d'Atrée, est digne de Thyeste (If such a sinister design isn't worthy of Atreus, it is worthy of Thyestes). This story first appeared in The Gift: A Christmas and New Year's Present for 1845, published in December, 1844 in Philadelphia by Carey and Hart. Poe earned $12 for its first printing. It was later included in the 1845 collection Tales By Edgar A. Poe. The epigraph "Nihil sapientiae odiosius acumine nimio" (Nothing is more hateful to wisdom than excessive cleverness) attributed by Poe to Seneca was not found in Seneca's known work. It is from Petrarch's treatise "De Remediis utriusque Fortunae". Poe probably took the reference from Samuel Warren's novel, Ten Thousand a-Year. Dupin is not a professional detective. In "The Murders in the Rue Morgue", Dupin takes up the case for amusement and refuses a financial reward. In "The Purloined Letter", however, Dupin undertakes the case for financial gain and personal revenge. He is not motivated by pursuing truth, emphasized by the lack of information about the contents of the purloined letter. Dupin's innovative method to solve the mystery is by trying to identify with the criminal. The Minister and Dupin have equally matched minds, combining skills of mathematician and poet, and their battle of wits is threatened to end in stalemate. Dupin wins because of his moral strength: the Minister is "unprincipled," a blackmailer who obtains power by exploiting the weakness of others. "The Purloined Letter" completes Dupin's tour of different settings. In "The Murders in the Rue Morgue," he travels through city streets; in "The Mystery of Marie Rogêt," he is in the wide outdoors; in "The Purloined Letter," he is in an enclosed private space. French linguist Jean-Claude Milner offered in Détections fictives, Le Seuil, collection « Fictions & Cie », 1985, supporting evidence that Dupin and D— are brothers, based on the final reference to Atreus and his twin brother, Thyestes. In May 1844, just before its first publication, Poe wrote to James Russell Lowell that he considered "The Purloined Letter" "perhaps the best of my tales of ratiocination." When it was republished in The Gift in 1845, the editor called it "one of the aptest illustrations which could well be conceived of that curious play of two minds in one person." Poe's story provoked a debate among literary theorists in the 1960s and 1970s. Jacques Lacan argued in Ecrits that the content of the Queen's letter is irrelevant to the story and that the proper "place" of the signifier (the letter itself) is determined by the symbolic structure in which it exists and is displaced, first by the Minister and then by Dupin. Jacques Derrida responded to Lacan's reading in "Le Facteur de la vérité" ("The Purveyor of Truth"), pointing out what Lacan "missed" and suggesting that it is not that the letter lacks meaning, as Lacan claimed, but that Lacan made the lack the meaning. The truth, for Derrida, is that the letter is a castration of the King by the Queen, which Lacan cannot see/abide/is blind to. Lacan's structuralist reading and Derrida's deconstructive reading provoked a response by Barbara Johnson, who mediated the debate by suggesting that the letter belongs all along to the Queen as a substitute for a phallus. Donald E. Pease suggests that Lacan "equates the possession of a letter—defined as a 'lack' of content—with 'literal' as opposed to 'symbolic' castration, hence the odor of the feminine. In other words the 'possession' of the lack otherwise displaced by language identifies the possessor with the lack 'she' thinks she possesses. So femininity exists as an 'effect' of the delusion of possession of a lack otherwise displaced (as a masculine effect?) by the endless purloining of the letter." The debate up to the mid-1980s is collected in a helpful though incomplete volume,The Purloined Poe. The volume does not include, for instance, Richard Hull's reading based on the work of Michel Foucault, in which he argues that "'The Purloined Letter' is a good text for questioning the metalinguistic claim that artists can't avoid doing surveillance, because it is a discourse on poetry's superiority over surveillance." Slavoj Žižek asks "So why does a letter always arrive at its destination? Why could it not—sometimes at least—also fail to reach it?" Hollis Robbins critiques Derrida for his own blindness to patriotism in prefacing his reading of "The Purloined Letter" with a reading of "The Emperor's New Clothes": "In Derrida's view, both Poe's story and Andersen's feature a king whose manhood is imperiled, who is surrounded by habit-driven and ineffectual civil servants, and who is saved by an individual who sees what is obvious. ... Both save the crown from further embarrassment. ... There is never a question that a king could or should fall from grace." "The Purloined Letter" was adapted in an episode of the 1950s television series Suspense, but the events were played out in a linear fashion. In 1995 the story was adapted for an episode of the children's television program Wishbone. The episode was called "The Pawloined Paper". In 2013 a theatrical adaptation of the story by Lance Tait was published. Ava Caridad wrote that "The Purloined Letter ... lends itself well to a one-act play." ^ Muller, John P.; Richardson, William J. (1988). The Purloined Poe: Lacan, Derrida, and Psychoanalytic Reading. ISBN 978-0801832932. Butti de Lima, Paolo (2007). "La sentenza rubata: il Seneca di Poe". Quaderni di Storia (65): 83–128. Derrida, Jacques (1987). The Post Card: From Socrates to Freud and Beyond (Paperback ed.). Chicago: University of Chicago Press. ISBN 978-0-226-14322-4. Garner, Stanton (1990). "Emerson, Thoreau, and Poe's 'Double Dupin'". In Fisher, Benjamin Franklin IV. Poe and His Times: The Artist and His Milieu. Baltimore: The Edgar Allan Poe Society. ISBN 978-0-9616449-2-5. Ostram, John Ward (1987). "Poe's Literary Labors and Rewards". In Fisher, Benjamin Franklin IV. Myths and Reality: The Mysterious Mr. Poe. Baltimore: The Edgar Allan Poe Society. pp. 37–47. Quinn, Arthur Hobson (1998). Edgar Allan Poe: A Critical Biography. Baltimore: Johns Hopkins University Press. ISBN 978-0-8018-5730-0. Retrieved 2011-12-31. Whalen, Terance (2001). "Poe and the American Publishing Industry". In Kennedy, J. Gerald. A Historical Guide to Edgar Allan Poe. New York: Oxford University Press. ISBN 978-0-19-512150-6. Wikimedia Commons has media related to The Purloined Letter. Seminar on "The Purloined Letter", Écrits, transl. by Jeffrey Mehlman, "French Freud" in Yale French Studies 48, 1972. This page was last edited on 7 March 2019, at 04:10 (UTC).